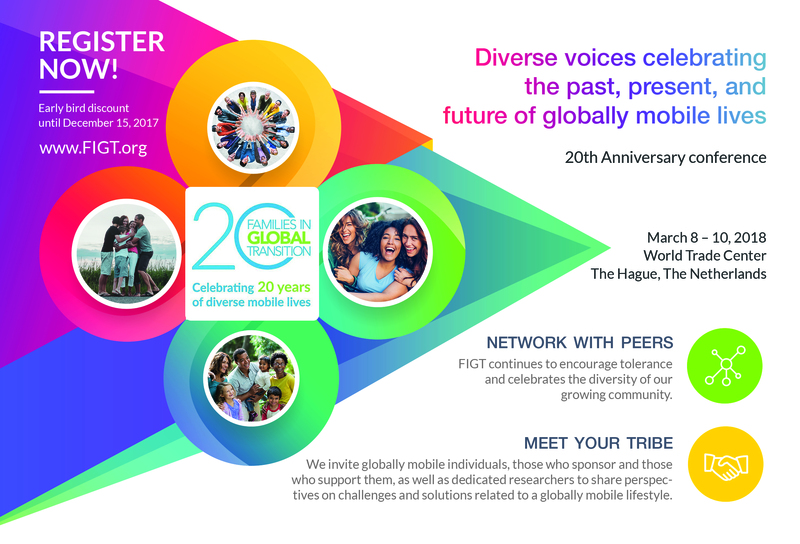 In anticipation of FIGT’s 20th anniversary celebration conference this year, we received many notes of congratulations from people who once attended, or have been affiliated with FIGT in the past but were unable to attend. Among those received, was a note from the company which used to administer FIGT’s membership system, website etc. “I wanted to wish you warm congratulations on the 20 years and the work you have done. Having supported the organization for a few years as the management office we came to greatly appreciate the mission of FIGT, the enrichment you gave professionals in family transition support, and the tangible sense of belonging you provided so many people. Heartfelt good wishes on your celebration of 20 years. Simply put, this world and our lives are better because of FIGT.” Brian Gorg, Collie Gorg Group. Since launching our Public Directory we have been able to direct inquiries from the public to the support and resources they were looking for. Members within our Public Directory who have a service or product can be searched by location or expertise by anyone, and in the near future will be sharing their knowledge through our blog. The introduction of a new membership level, introduced at 2018 FIGT conference had just this in mind: enriching lives and giving a sense of belonging to those within our community: not only for our members, or those who have attended conferences, but also for those new to FIGT or global living. While individual members can interact, learn from one another, share insights, look back on past conference material, take advantage of webinars etc. ; our new small-business/associate/non-profit level make something similar available to the public – to members and non-members. Our members, at all levels further enrich FIGT as it is because of their support, commitment to and belief in FIGT that we are able to continue to do the work we do. Without our members FIGT would not be what it is, and for this we thank them all. Know someone or an organisation looking for support pre-move or in a new location? Search our Directory or check our Affiliates pages, there may be a local chapter of FIGT near you. Want to change your membership status, to become a part of the Public Directory? Contact Judy, our Administrator. Copies of Reunion of Strangers can also be purchased as a paperback at Amazon.com & Amazon.co.uk. Who goes to the FIGT Conference? 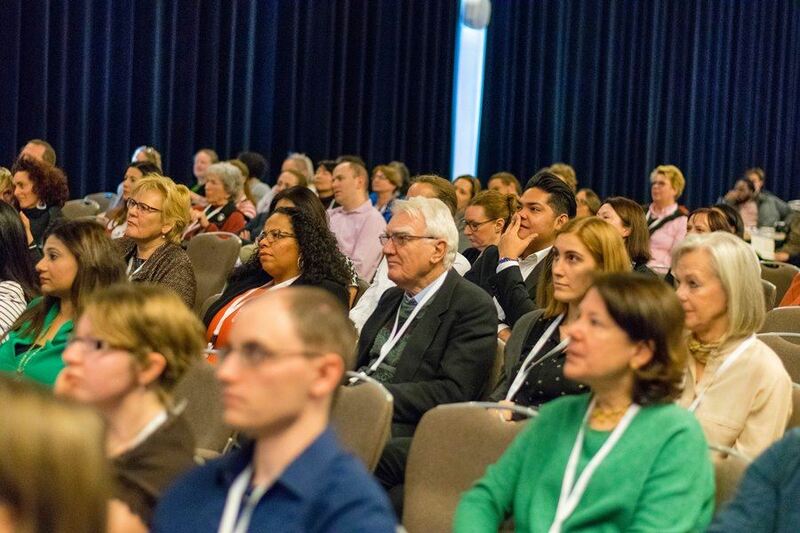 Don’t miss out on the #FIGT18NL Earlybird special ending on 15th January – gift yourself the opportunity to learn and connect with the nearly 200 attendees already registered, joining us from 30 countries. You might be curious to know who you might meet, what you can expect. Well – you’re in for a treat! This year’s conference promises to be our biggest ever; many registrants are long time friends and members of FIGT, and we’re excited to welcome the half of first-time attendees who are seeking to learn more about our wonderful forum. Not to mention a wonderful panel of keynote speakers, contributors and sponsors. All of our keynotes are seasoned expats with a lifetime of firsthand expat/TCK experience and education – you won’t want to miss out. 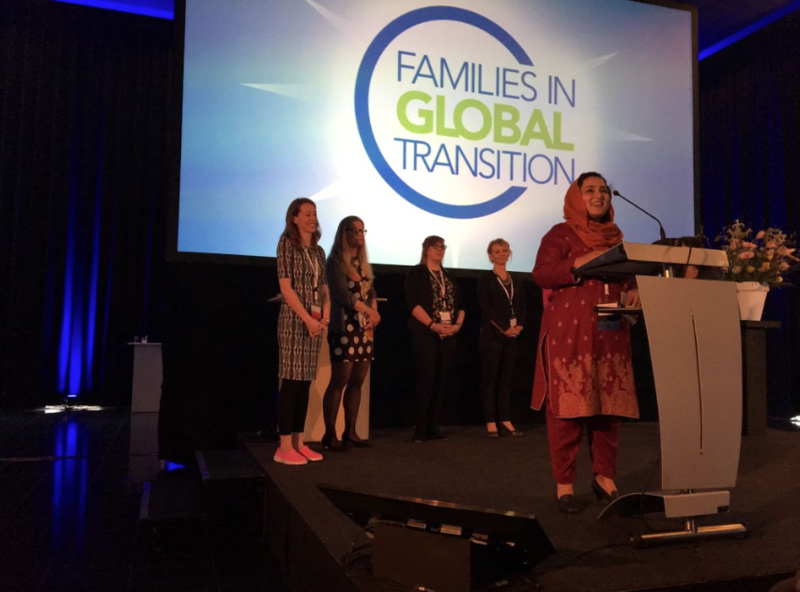 Each year, we welcome a wonderful range of people from each corner of the world, in search of connection, learning, support and the latest observations in how life is impacted by global transition – and #FIGT18NL is no different. Typically, FIGT attendees come on their own and love that they leave with new found friends, knowledge and memories. They hail from diverse backgrounds and interests ranging from family support, missions, coaching, education – many are expats or global nomads, Third Culture Kids (TCKs), and educators seeking the latest thinking in how global transition affects their life trajectory. Or, they are simply looking to connect with a like-minded community and to make new friends. Whether touched by a childhood of nomadic life, have found yourself in a foreign land, or are simply keen to explore the latest knowledge in international transitions – then do not hesitate to register now. Don’t delay – the Earlybird countdown is on! FINAL Conference Keynote speaker announced! 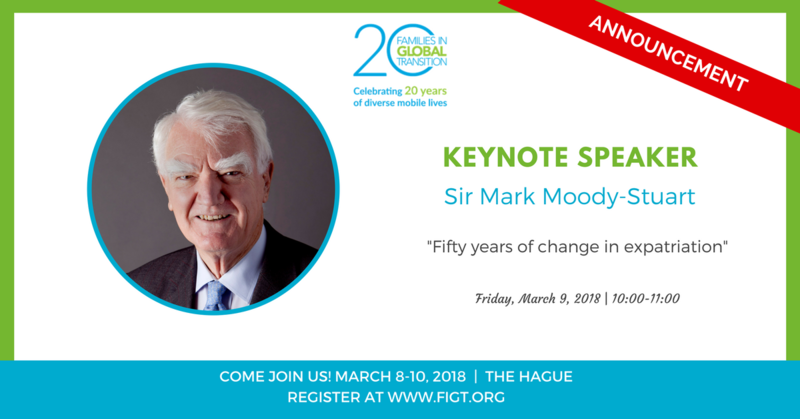 We’ve extended the earlybird registration for #FIGT18NL FIGT Conference, and you won’t want to miss hearing from Sir Mark Moody-Stuart! Sir Mark is the latest Keynote speaker we can formally unveil. His extensive tenure with Shell took Sir Mark around the world over a career spanning 40 years, and countries around the globe from Australia, Malaysia, Turkey, Oman and Nigeria, to mention a few. Born in Antigua to the son of a sugar plantation owner and educated at Cambridge University in England, UK, Sir Mark was knighted Knight Commander of the Order of St. Michael and St George in June, 2000. Sir Mark will be talking about ‘Fifty years of change in expatriation’ – a topic he is perfectly positioned to explore given his unique experience as an expat started in 1966. 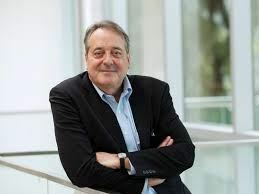 More recently serving in executive leadership roles at Royal Dutch Shell Group as Chairman and of Anglo American, Sir Mark launched is career as a geologist. Throughout a distinguished career, Sir Mark has observed huge changes in the way that organisations manage their mobile workforce – as a result of the changing family dynamics, the needs of a business to have expertise in the right place and the right time, and the influence of technology on globally mobile lives. Sir Mark will provide us with insights that only he can provide as an expat himself, and as a leader of major global organisations. Sir Mark’s accomplishments extend beyond his business and expatriate experience. Passionate about ethics, corporate and social responsibility, in 2014 Sir Mark penned his thoughts in his book ‘Responsible Leadership: Lessons from the Front Line of Sustainability and Ethics'. Part memoir and part manifesto for leadership, he writes about his journey from geologist to being at the helm of two of the world’s largest organisations, and his viewpoint on corporate engagement with sustainability, ethics and responsibility. We are excited and honoured to have Sir Mark as a speaker at #FIGT18NL FIGT Conference. Be sure to book your ticket now. Tickets are selling fast, so don’t miss out! 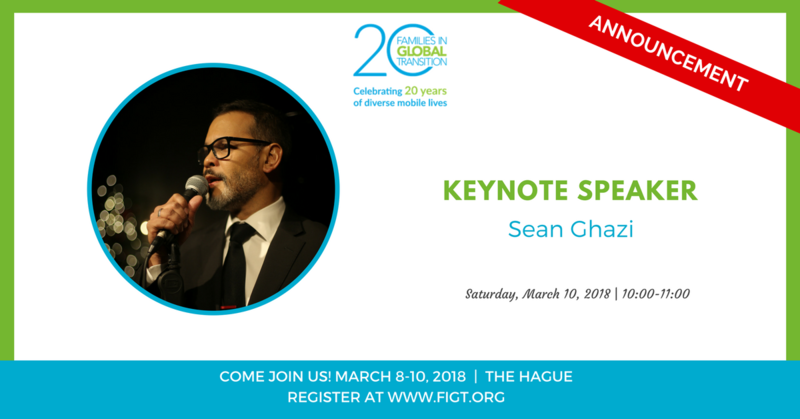 With a mere days left until earlybird registration ends for the #FIGT18NL FIGT Conference, we’re so excited to tell you more about another keynote speaker that joins the line-up. Actor and singer Sean Ghazi will be sure to offer gripping insights from the stage with stories of his travels, career, accolades, and his international lifestyle. Sean was born to a Malaysian father and Singaporean mother and is a third culture kid (TCK) after being educated in Singapore, Malaysia and Boston, USA. His career as a performer has taken him to Europe, Southeast Asia, and more recently the USA. Sean’s most recent run was playing the lead role of George in La Cage Aux Folles for W!LD RICE in Singapore. He is kept busy as the current Artistic Director of the popular entertainment venue BOBO in Kuala Lumpur whilst developing his band act ‘TARAKUCHA’ – a unique blend of vintage Malay songs with a big band sound and hint of Broadway. After losing his mother in 2009, Sean made a life change and embarked on the American Dream. With a Green Card and experience in Hollywood, Sean moved to the USA with a desire to become a Hollywood Actor and gain more screen acting experience. He achieved one independent Hollywood movie “C.O.G.” with Jonathan Groff. Sean’s time in Hollywood wasn’t easy, and not the first time he tried to launch his career on foreign shores – he tried London and Germany, as well as the USA. His challenge in Hollywood was with the industry struggling to know how to cast him in suitable roles! They simply didn’t know who Malaysians were and encouraged him to audition with Hispanic actors. Besides the movie, he acted in TV commercials and other work to pay the bills. We can’t wait to hear more about his trials, belonging and wide global experience at the conference. Don’t hesitate to book your ticket now so you don’t miss out on Sean’s story, along with Robin and Sir Mark Moody-Stuart, who we’ll be profiling in our next Blog. The conference brings together a group of budding writers who will be mentored by Jo Parfitt on how to write articles for a global market that get published. In return for this extensive training, mentoring, and a full scholarship, the residents will be chronicling about the conference. They’ll be interviewing, blogging, writing articles, and posting about the conference on social media. 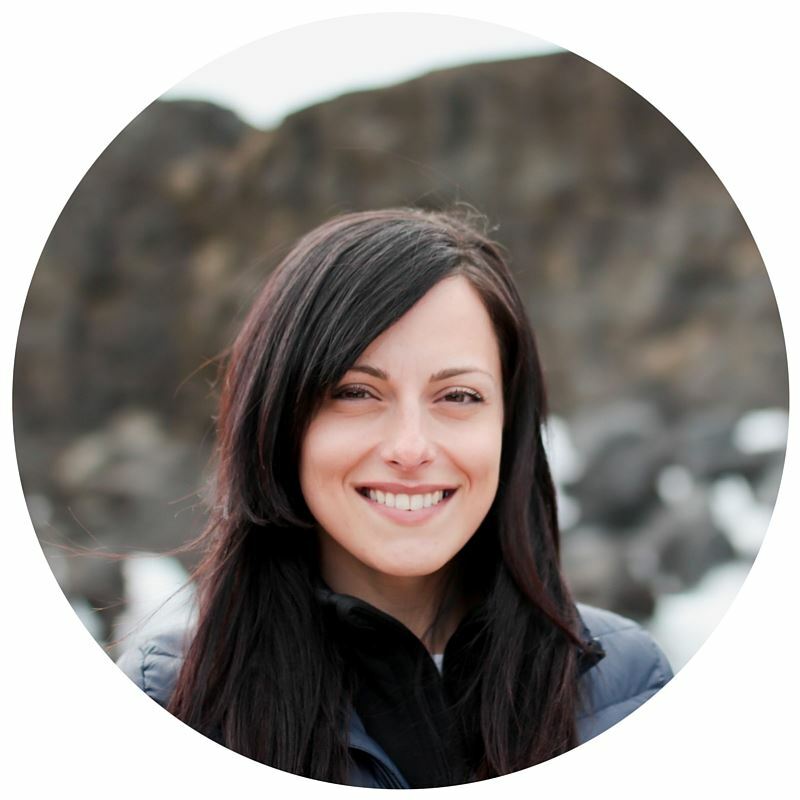 I’ve had a chat with Lillian Small, FIGT’s Social Media Lead who is one of the PPWR residents. Here we learn more about Lillian, how she had a career transition to blogger, writer and digital marketing expert, her expat experience that led her to supporting FIGT’s communication team and what she’s looking forward to about the conference. FIGT Blog Editor: What influenced your decision to pivot to a writing career from being an engineer? FIGT Blog Editor: How do you think your expat background has helped to shape your career? FIGT Blog Editor: What led you to FIGT and the PPWR Residency? FIGT Blog Editor: What excites you most about PPWR and the conference? Do say hi to Lillian when you see her at the conference. If you’d like to learn more about her, visit her blog, The Smalls Abroad. Stay tuned to upcoming blogs where we’ll be introducing more of the PPWR residents and conference speakers. The Annual FIGT Conference is edging nearer, and lots of plans are in progress behind the scenes! Make sure you keep checking in to be the first to know the exciting news as we share it. We’re excited to announce our first Keynote Speaker for the event - Robin Pascoe. Robin is a long-time friend of FIGT, and is one half of the Parfitt Pascoe Writing Residency program. Robin is known as ‘The Expat Expert’ and has written no less than 7 books on living abroad, ranging from relocating your marriage, parenting global nomads, and guides to help expat wives successfully navigate their time overseas. Robin is currently the Director of Global Communications for the Maple Bear School, a global network of Canadian curriculum schools based in Vancouver, Canada. Robin Pascoe was among the first wave of expat writers to create and promote the language we use to understand the strengths and challenges of the globally mobile family. And for over twenty years, she traveled around the expat world reassuring families by introducing that language and articulating shared experiences. In her keynote address, she will re-examine the meaning of the words “families” in “global” “transition” in the context of diversity and relocation in the 21stcentury. And, using her trademark humour, she will share her stories of the past 20 years and her vision for the next. As an international speaker, Robin’s expertise takes her all over the world. She is known as being funny, engaging and inspirational. Robin’s global living experience was earned as a Canadian diplomatic spouse and parent to two Third Culture Kids on postings in Bangkok, Taipei, Beijing and Seoul. Robin’s topics all relate to global living, and are invaluable insights into repatriating as a spouse, dealing with culture shock, and practical ways for wives and parents to deal with the challenges of adapting to a nomadic life. 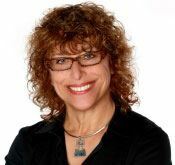 Known as an authority about expat life, Robin has been widely interviewed and featured in major publications such as The Wall Street Journal, The Washington Post, The New York Times, The International Herald Tribue, Working Mothers Magazine, Utne Reader, CNN, to name a few. We’re so excited to welcome Robin as part of the FIGT Conference experience! Robin’s website, The Expat Expert. 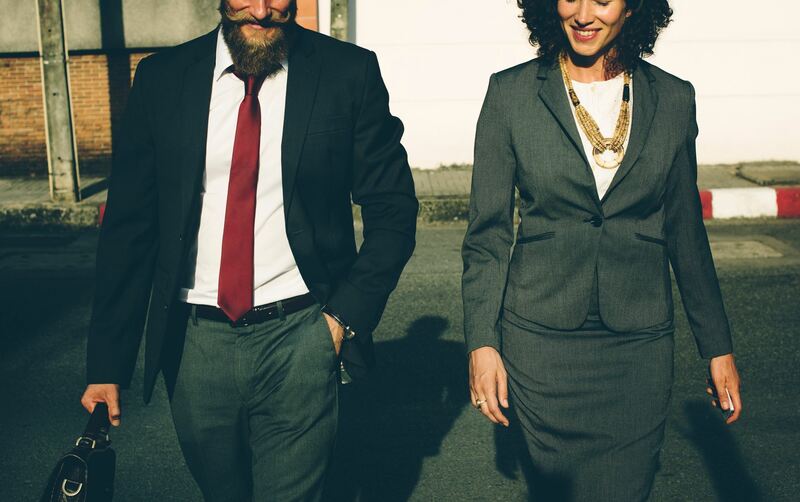 A recent Financial Times article "Women still hesitate to accept foreign assignments: Travelling spouses are rarely men" states that "Women’s earnings and potential salaries are so rarely equal to men’s that we still see the “travelling” male partner as unusual". This was certainly Carolina Dantas' experience. When I announced to my colleagues that I accepted an offer in the company for a long-term assignment overseas, the first question everybody asked me was “what about your husband? Is he quitting his job?” With my clear “yes, he is coming with me”, the following reaction was “oh… he must love you so much”. I have no doubt about my husband’s feelings, but my colleagues’ reaction still intrigues me. People knew I was ambitious, I was working very hard to progress in my career and I was doing well. With the exposure I was having to global leaders, an opportunity abroad should be the natural next step. So why was my husband the first thing to come to people's mind? Frankly, he was my first concern also. By the time I got the offer, he was earning about 30% more than I was. His career was progressing well too. People did not know, but I had declined other offers previously because the place would not offer much to him personally or professionally. However, this time we were talking about London! Still he would be pausing his career dreams to follow mine. He would become the dependent spouse in a foreign place. He would not get a visa on his own. His work permit would depend on the company I worked for. I did not want to carry the lift of compromising his career either. I did not want to hear the classic “I gave up on everything for you” in any moment of stress that every relationship goes through. So I called my dad. In a sexist society like the Brazilian one, he would give the male perspective I could miss and still be on my side. Here is his precious advice: “it’s his decision, not yours”. For a feminist like me, it hit me first, but he continued: “You have no decision to make. The company is offering you a promotion, a great raise, a complete expat program in an excellent location. It is everything you obviously want. Therefore, you have no decision to make. He is the one to decide if he wants this new life”. Sheryl Sandberg said that the best career decision you make is about the person you marry. This was so true in that moment. To be a senior executive with a global career, I needed a husband that shared my lifestyle and dreams. And he did. Gladly. Living abroad was his dream too and there was no other better opportunity to go. We set a time and a plan for this break in his career. He got an international certification, did some consultant work, played a lot of tennis and made more friends than I did. It was not easy for him in many occasions, but we both took the most of this great opportunity. In the end, we decided to have a baby and to have him back in Brazil, closer to our families. It took him 8 months to get a new job, but he got a great one - even though Brazil was in the middle of a terrible recession. Now I am the person in home full-time. During the uncertainties of not being a working-partner and not having my career identity, my husband said to me “my career is our problem as much as your career is our problem too”. I believe this is the real meaning of dual career. Carolina is an international executive, former global director in Nielsen, mother of 2 kids and was the first female Brazilian to take an international assignment. Are you a writer? Do you aspire to be a writer? The PPWR 2018 Residency deadline is looming! Here, FIGT Member Tone Indrelid writes about the impact last year's participation had to her. If you are keen to apply, visit the PPWR page for more information and be sure to submit your application before October 1st, 2017. Follow me, walk through that open door. Five years ago, I lived on Borneo, with three kids under 6. I was The Parent of my household. I can’t really say how it happened – I certainly never intended to be The Parent. If you were to ask The Wage-earning Partner in my marriage, I suspect you may hear a distant cough sounding like ‘control freak’, but I object to that. I wasn’t always happy being The Parent. Don’t get me wrong – I love being a mother and I am super thankful for the time I am able to spend with my kids. That said, I have also struggled to adjust to role expectations, my own and those of others, within my marriage and in relation to the world. I wanted a way to combine The Parent with The Ridiculously Slow Internet, The Frequent Moves and The Writing Anthropologist. Moving to Muscat, The Ridiculously Slow Internet was finally replaced with Broadband Internet, and family role patterns and responsibilities were adjusted to allow for The Parent to work from home. One fine Tuesday morning, I saw it. Jo Parfitt’s Facebook link to the Parfitt Pascoe Writing Residency at Families in Global Transition. I read it. I loved it. I was convinced it was made especially for me. Did I want to train with a successful author and publisher, learn the tricks of the trade and contribute to a book? Yes! I knew I was nowhere near ready to apply for the scholarship – but I did anyway. I never looked back. Sometimes, doors open, in the most unexpected ways. Jo’s input as a mentor, my position as a Parfitt Pascoe writer and the connections I made through Families in Global Transition has led to some incredibly positive developments for me. First of all, I connected with all of you through this blog. I love writing here, and I hope to spend much more time here in the coming months. This is my other trail, and I am delighted to walk in your company. In addition, I have been offered a blogging post with The Turban Times, focusing on the MENA region, as well as with the refugee relief organisation Carry The Future. Are you a budding writer? Would you like to train with Jo, make invaluable connections with other writers and kick-start your own path? Do consider applying for the Parfitt Pascoe Writing Residency at Families in Global Transition. It may be one of the best choices you ever make for yourself. Go ahead, look it up! Tone is an introverted anthropologist walking the expat trail. You can find her on her blog, The Other Trail.